Alexander Girard was the head of the Textile Division of Herman Miller Inc. from 1952 to 1973. During this time, he created over three hundred designs for textiles coordinated for use as upholstery fabrics and draperies for private and commercial interiors, exhibitions and corporate identity programs. His exuberant use of color, texture and pattern drew from folk art and Op art influences, synthesized into a unique style which became “the look” of 1960s America. Ultimately settling in Santa Fe, New Mexico he continued to practice as a designer in the all-inclusive sense of the word, by creating residences, commercial interiors, exhibitions, furniture and textiles throughout the duration of his career. The same year that Herman Miller entered the international market, Alexander Girard introduced Feathers, a pattern that came in six different color ways as well as types of fabric. In this example overlapping strips of green, yellow, brown, and purple create subtle color variations where the diamond shapes overlap. Something between a collage and drawing, the pattern represents the immediacy of its design process. 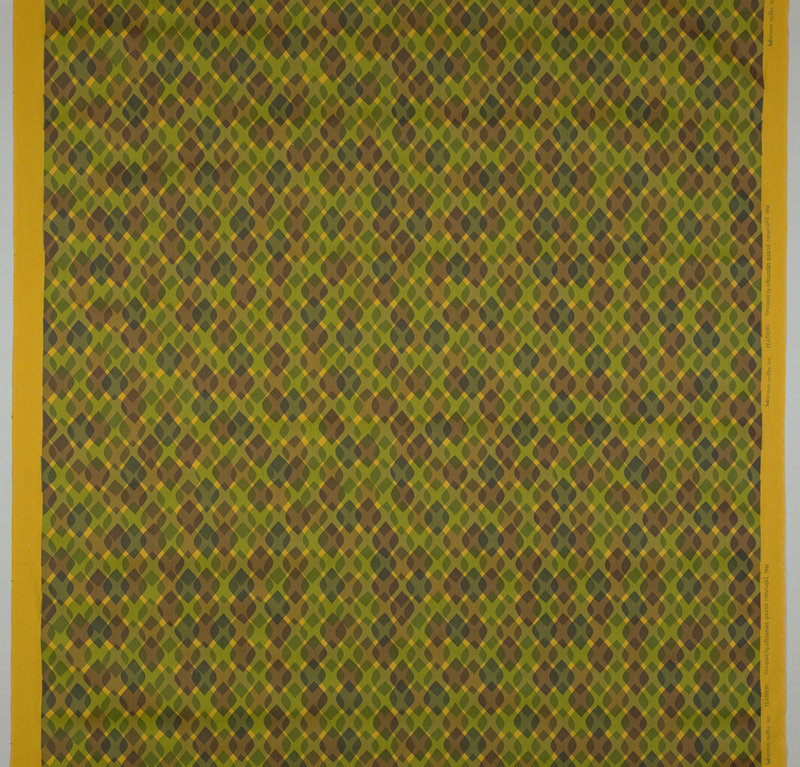 Girard used this technique of color transparency in other patterns – Ribbons (1957), Crosses (1957) – achieving a sense of depth that is not present in his other fabrics.